Does anyone remember seeing this? 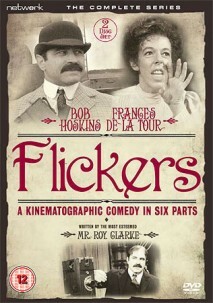 Flickers (“A Kinematographic Comedy in Six Parts”) was a 1980 UK television series set in the early days of the silent film business in Britain, produced by Thames and directed by Cyril Coke. one of the daffiest and most hilarious original screenplays written for television. As Arnie and Maud stagger through their unusual relationship, ”Flickers” provides representative samplings of types involved in the motion picture business, from short and alcoholic comedian stars to corrupt lawyers, from aging child stars to lazy cameramen. I’m intrigued. Anyone out there with long memories? I’m a bit too young to remember Flickers, but there was another series ‘Smokescreen’ produced by the BBC in the early 1990s and set in the early days of British cinema. This was set in Yorkshire, and starred Timothy West as a filmmaker who employs a local girl to work for him. I remember it being shown on Sunday evenings about 5.30 and may have been part of the BBC’s output for children’s programming. I don’t know if it is available on DVD. Frank Sherringham is an eccentric film-maker who battles against unscrupulous rival cinema owner Albert Gold in a working-class Northern town in the early 1900s. The whole town becomes involved in the vendetta, including Chrissie Gallant, who lands the part of the lead boy in one of Sherringham’s films, and also becomes embroiled in the complicated love life of Sherringham’s daughter, Vicky. Also starred Anita Dobson, Joan Sims and Paula Wilcox. 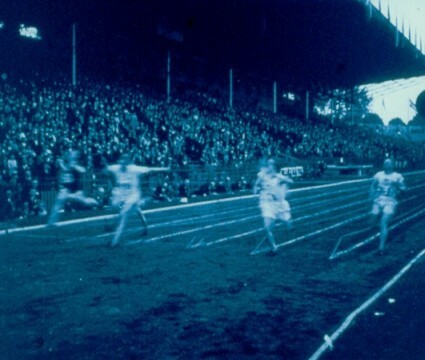 I remember Flickers, and I’m tickled blue there’s a dvd release planned. It’s a charming series. It captures the pioneering seat-of-their-pants production methods of early British cinema very effectively. There was a second early film related comedy-drama series entitled Pictures, which wasn’t as good as Flickers, but I still like it. Now I’m interesting in Smokescreen. http://ftvdb.bfi.org.uk/sift/series/12128. Starred Peter McEnery and Wendy Morgan. I remember when Flickers played on Masterpiece Theatre in the US. I believe it was the first time I saw Bob Hoskins. I hope I can get the dvd in the US. It seems that FLICKERS was rather more appreciated in the US than at home. Leslie Halliwell and Philip Purser’s Halliwell’s Television Companion (a largely forgotten reference work of great value) dismisses FLICKERS: “a six-hour drama serial from ATV about the tribulations of a group of travelling film showmen at the turn of the century. No attitude is ever established, and the result is more off-putting than compelling”. No, I’ve not much idea what that means either. On PICTURES, Halliwell (and it’s him in both cases) says “Roy Clarke digging away again at the early days of the English cinema … dialogue that matched the period only in the most superficial way”. Not a whole series, but one episode of The Mind Of JG Reeder from 1971, Death of an Angel, is an investigation by our eponymous hero (Hugh Burden) into murders at a British silent film studio; James Grout as the director, Amanda Barrie as a leading lady…a good series, also available on DVD from the good people at Network. FLICKERS is absolutely delightful,and was issued on DVD in the US several years ago, allowing me to retire my ancient VHS copy. The cast was terrific, apart from Hoskins and LaTour who played off each other brilliantly, there were fine performances from Phillip Madoc, Dickie Arnold as music hall comic turned silent film comic Corky Brown, and everybody else in the ensemble. Roy Clarke’s script gave us a fascinating group of well-fleshed-out nearly-Dickensian characters and really caught the feel of the desperation of the infant industry.Ignore Leslie Halliwell’s usual cluelessness, this was and is a great series. I saw, and loved, “Flickers” on Masterpiece Theatre, but was so sure that the title was “Nickelodeon”. Have been searching for, and not finding, that title, but finally got smart enough to look up Frances de la Tour. Does anyone else remember it under that name? Or was this just my little figment? Anyway, now I can order it. Hooray!